A presentation photograph of Jack King sent in by Jackie Roach. Jack King was a Charge Hand in No 17 Shop (I think) Welding. Work colleagues included Hughie Demelo, Al Koncevicius and Eric South. 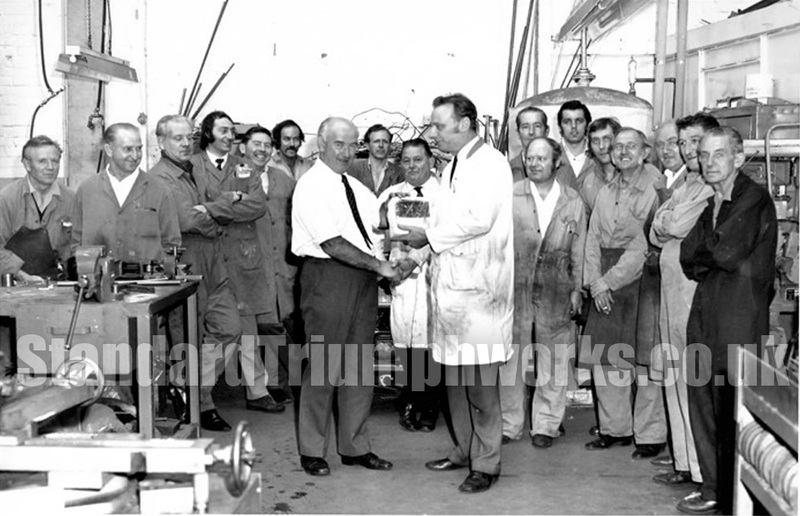 UPDATE: The photo of Jack King giving a presentation, was to say farewell to Joe Leach, Pipebender Chargehand, Jack was Foreman of the welding section, the chargehand was Bernard Jones. As I recall extreme left was Shop Steward John McCusker. ? ? ? Tom Daley, Me (Pete Davis) Tommy McGowan, Emlyn Hughes, Len Edwards and Bert Coggins. What a great team of mates!